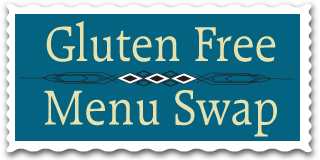 This week’s Gluten Free Menu Swap is hosted by Celiac Family and the theme is pineapple. Yum! We love fresh pineapple. It is one of my husband’s favorite fruits and I always try to buy him one when they are on sale. I will have to see if they are on sale this week. We usually don’t do anything special with pineapple, just cut one up and eat it, mainly because my husband isn’t one for sweet fruits in his savory food. We have grilled it once before and that was pretty good. So I will be interested to see what others do with their pineapple. Maybe I can convince him to try it as part of a dish one of these days! Red Kidney Beans and Tomatoes with Rice and Steamed Broccoli – and perhaps some dosa, if I can get my act together! The kidney bean recipe is new-to-us and from one of our favorite cookbooks, Indian Vegetarian Cooking from an American Kitchen by Vasantha Prasad. Chickpeas in Tomato, Ginger and Garlic Sauce with Rice – one our all-time favorite recipes from the same cookbook above, Indian Vegetarian Cooking from an American Kitchen by Vasantha Prasad. Quick Summer Pasta – this is one of my very simple, make-it-up as I go along recipes that I will attempt to document for you. Spicy Tofu with Vegetables and Rice and Cucumber Salad – one of our go-to quick summer recipes. Be sure to head over to Celiac Family later this week to check out everyone’s menus for some inspiration. I am hosting next week’s GF Menu Swap with a theme of “Light and Easy for Summer”. What are your favorite, quick and easy, don’t turn on the oven (or even the stove) meals? I hope you’ll let me know next week! Pineapples are definitely a good ingredient to feature. Must see what everyone else shared. Mr. GFE just mentioned the pineapple sundae at one of our super popular frozen custard places yesterday and I’ve been pondering making a dairy-free, vegan version since then. I think it would be easy to do. I also made Kim’s pineapple, bacon, and arugula salad recipe for my support group recently and that was pretty amazing. Ooo, I forgot how much I used to love the pineapple that you’d get on a sundae (syrup, preserves, what was that stuff considered anyway?). And custard…mmm. Custard was big back in Chicago and Wisconsin. We never had it when I was growing up in Ohio. I would love to see a recipe for that, Shirley! We adore chickpeas here. We’ve come a long way from when we just thought chickpeas were those weird brain shaped things on fancy salad bars. And with all those yummy spices and flavors. Heaven. Sounds like a great meal plan!